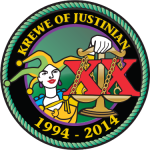 Our private labeled Justinian wine from California is always available and by buying Justinian wine, you help the krewe raise money for the Shreveport Bar Association and the Shreveport Bar Foundation’s pro bono and other charitable activities. Hey — you’re going to buy wine anyway — so buy it from us! Reasonably priced at $16 per bottle and $192 per case (tax not included). Split cases of Cabernet Sauvignon and Chardonnay are available. These are delicious wines that will pair perfectly with your favorite holiday meals or party treats — or be great as client or neighbor Christmas gifts.